The schools are about to finish for the mid-term break leaving parents looking for ideas to entertain their children. YourDaysOut and The Herald have teamed up again to bring you fantastic savings on some brilliant family days out. All next week, we will publish coupons that you can use to get discounts on admission to some of Dublin's favourite family days out. Leisureplex venues offer you the ultimate bowling experience! Kiddie ramps and ball walls for our very youngest bowlers so they can strike out. Tenpin Bowling can be enjoyed by people of all ages and it’s a great way of getting in some light exercise. The venues also have Quasar, Arcade Games and some have Zoo Indoor Play Centre. The coupon is 2-1 of any available activity in Leisureplex Stillorgan, Leisureplex Coolock, Leisureplex Charlestown, Leisureplex Tallaght, Leisureplex Blanchardstown. The National Wax Museum Plus is an exciting interactive visitor attraction located in the heart of Dublin's city centre on Westmoreland Street. Children will enjoy loads of the pieces and there are so many little nooks and cranny's to explore - some designed specifically for little people to crawl through - but there will be a few bumps on the head as they try and navigate through the hall of mirrors. The coupon is for 2-1 admission during mid-term. EPIC | The Irish Emigration Museum is the new Irish diaspora museum in Dublin. It brings to life the story of how Ireland's people spread around the globe and how they changed the world. Housed in the iconic CHQ Building visitors will be taken on a journey that starts on the island of Ireland and ends with the global presence of Irish people today. The coupon is for 2-1 admission during the mid-term break. Glasnevin Cemetery Museum tours are delivered by knowledgeable guides who proudly tell the story of modern Ireland with a careful balance of passion, sensitivity, and fun! Celebrating history, heritage and culture, with an intriguing journey through Ireland’s past. Get 40% off adult and family tickets. Over 1 million people visited Aquazone at the National Aquatic Centre in Blanchardstown every year, and it's easy to see why. The Indoor fun waterpark has loads of wild waterslides, a wave pool, a lazy river, a pirate ship for the little ones and Flow Rider surf machine. The discount coupon can be used anytime from 10th - 24th February, offering 3 for the price of 2, saving €14. 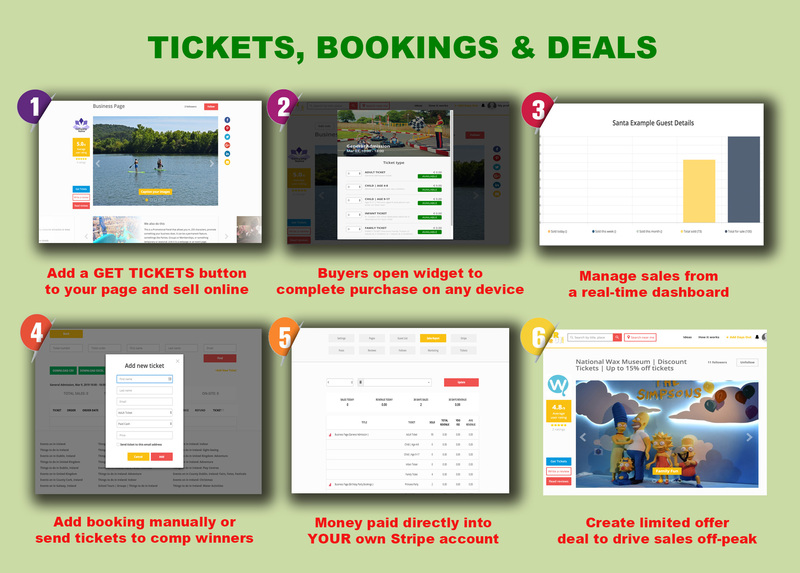 YourDaysOut is a sales and marketing platform for local businesses and event organisers with tools to help promote activities, publish events and also create and sell tickets online, for up to 50% less that other ticket sites. It is also No.1 in Ireland for people looking for things to do, where users can FOLLOW their favourite pages, get notifications about any offers, events and buy hotel deals in Ireland.